On Wednesday February 13th, Daybreaker comes together in the land down under for the first time ever. Thanks to our friends at SEA LIFE Sydney Aquarium, our Sydney Launch will take place in the city’s latest innovation and most EPIC space we could ask for – the brand new interactive Day and Night on the Reef Exhibit. Imagine a multi-sensory experience that will float you through the largest Great Barrier Reef display in the world. Dance with sea turtles, reef sharks and more than 500 other mesmerizing sea creatures and tropical fish. This is your call to come dance with the magic that’s been inspiring almost 25 cities globally and moving the world towards more community, self-expression, mischief and belonging. 1.) Dress in Theme! Every Daybreaker has a theme that conveys a global message. From city to city, whether you’re in LA, New York, Paris, Amsterdam, Tokyo and beyond — our themes are a nod to our togetherness. Think mermaid tails, sparkles and shimmer, anything coral garden-esque. 2.) Sign up for Yoga! We kick off all our events with an epic yoga session to centre your heart and ground you for what’s about to happen. Thanks to our friends at Power Living, we have the legendary Jordan Berger and Cazz LeMessurier leading our yoga sesh for the first hour, with tunes by Jen Stallard and Andre Meyer. As the Yoga + Dance Experience tickets are limited and go quickly, you can also just opt for “Just Dance” tickets! 3.) Dance. Unlock on the dance floor and let your freak flag fly! Our original Daybreaker Emcee Elliott LaRue is flying in from New York City to keep you inspired every step of the way. We are a safe space to connect to yourself, move with reckless abandon and leave the judgement at home. 4.) Funky Beats. Our DJs are sometimes super underground, sometimes world-renowned, but always epic and inspiring. For this one, we’ve got Night Tales, the electronic DJ duo from the minds of Third Floor and Kamaliza. 5.) Surprises. We always have special elements and surprises. You never know what you’re going to get. It won’t be long before you begin to realize why this is more than just a dance party. We will also provide free morning beverages, breakfast bites & more (while they last)! So come wake up with us. Just this once. And see how it feels. It takes a village to get this going at full speed, so please spread the vibes. The countdown begins. See you on the dance floor. 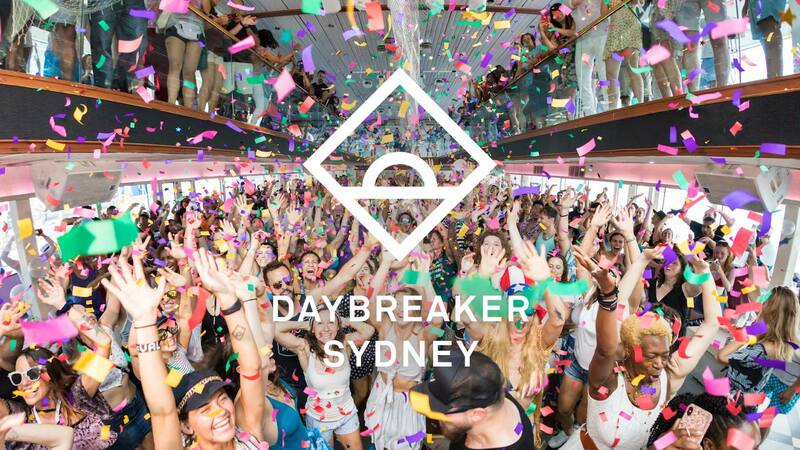 RSVP on Facebook, then slide into the Sydney Facebook Group for early invites, exclusive pre-event offers, morning hacks, and to find your local Daybreaker fam. PS — we are proud to announce that this event will be climate positive, courtesy of CHOOOSE who is helping us offset more CO2 than our carbon footprint for the morning! Lastly... we’ve teamed up with special community partners General Assembly Sydney, Power Living Australia, and Kapow Meggings for this event to make the morning extra powerful. GA offers pioneering, experiential education in today’s most in-demand skills, and a specialised full-time job and partnership recruitment team - who help you thrive in the fields of today’s rapidly changing technological economy. Power Living studios teach modern-day yoga practices that will enrich your life by developing your physical, mental and philosophical yoga practice. Power Living Yoga isn't just a style but more of community, a teaching method and way of being that transforms your practice every time you step on the mat. Kapow Meggings is here to add some swagger to your street style with their collection of super colourful men’s yoga & festival leggings. You can use the code "DAYBREAKER" when checking-out for an exclusive 25% OFF. © 2019 Ticketbooth on behalf of Daybreaker Events Australia. All sales are final. Tickets are non-refundable.